It is funny how certain dishes grab your attention immediately on a menu. The one that got my eyeballs today, when we were having lunch at a local surfer’s café, was “Bunny Chow Chicken Curry Pizza.” Now that is a mouthful to read! And parsing it took me into an unknown space. I tried conjuring up the components and an image of rabbit’s ears together with ‘number 55 chinese take away’ on a piece of fine Italian dough came to mind. Not a pretty sight. Gary laughed at my naïve translation; pointing out that the bunny derives from a South African word for a local indian people (Bania) and not from the pet rabbit. 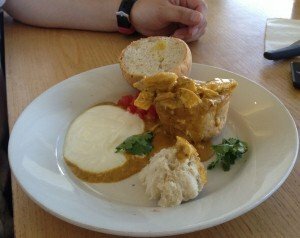 Usually it is just called bunny chow chicken curry but this dish had been extended, presumably for the macho surfer – in the way the ‘gutbuster breakfast’ at a certain all nighter cafe in Brighton, UK has become legendary for serious nightclubbers in the early hours. The café we were visiting was located in Muizenberg – a popular very blue and laid back beach place, open to surfers of all levels. It was on the front with fantastic views overlooking the bronzed bodies and shark tattooed boards. Gary had the bunny (see above) and I had a less evocatively named, but still tasty, toastie sarnie. The original South African dish originates from the 1940s as indeed a kind of take-away. The local Indians, who were not allowed in certain cafes and shops during Apartheid, were served a lovely curry, out the back of the restaurant window in Durban, in a scooped out loaf of bread. The bit that was scooped out was then put back on the top like a plug – the bread acting like a container. The modern day version is more refined but the sentiment behind the dish remains. And apparently the butter chicken is every bit as scrumptious. I remember frequenting an American-style bakery chain, called Panera, at lunchtimes when I lived in Bloomington, Indiana. It also used to serve piping hot food in very large scooped out sour dough bread – if requested by the customer. They literally called it a ‘bread bowl’. Bunny chow, however, looks and sounds much better. Just like I find the name odd, I find it strange that you can eat the container your food arrives in. Now, that really is sustainable cooking.